The Gay Men's Chorus of Los Angeles knocks it out of the park when it comes to community outreach. Their Alive Music Project (AMP) brings anti-bullying messaging to schools once a month during the school year. 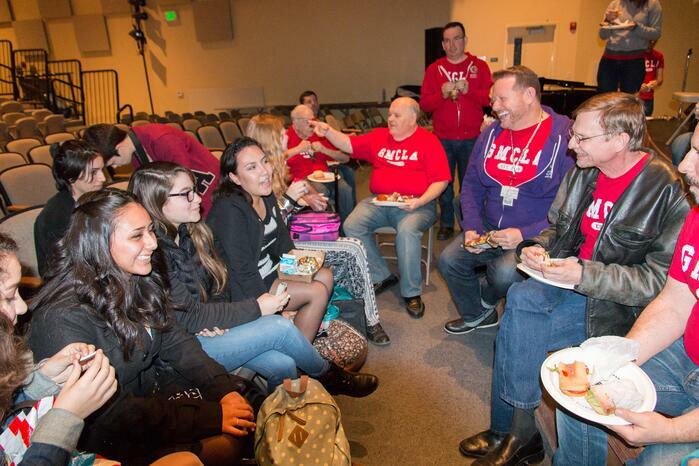 In its 10 years of existence, it has reached over 50,000 middle and high school students in the Los Angeles area. 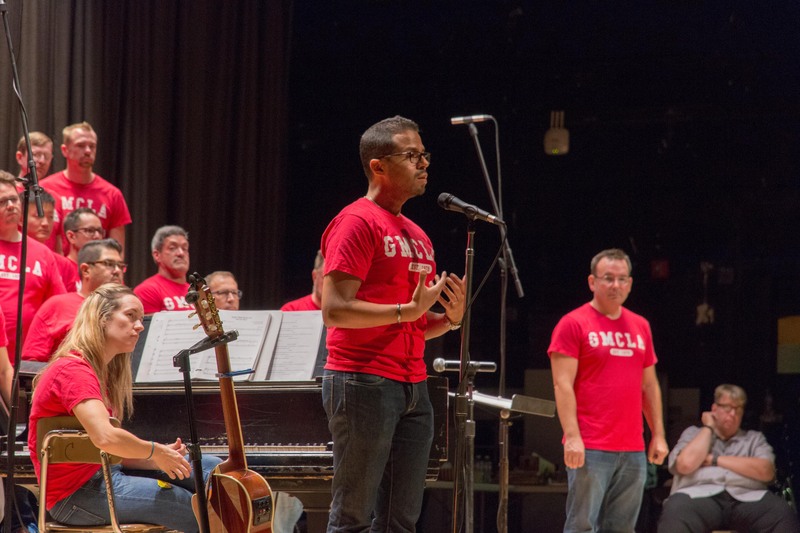 Gavin Thrasher, GMCLA's Assistant Conductor and Alive Music Project Coordinator, says that AMP "uses music as means of communication and creating connection with students who need help with LGBT and bullying issues." The program was implemented in 2007 as a graduate school research project studying the impact of LGBTQ education in youth. Joe Nadeau, GMCLA's Artistic Director and Conductor, says that while the project started small, it has now "grown into something quite a part of who we are and what we do. It's a part of our culture and one of the most important things we do." The chorus starts by contacting local schools to arrange a GMCLA-hosted anti-bullying presentation for students. Thrasher says, "We try to contact the Gay Straight Alliance at the school or the choir, which tends to be a safe space if there is not a GSA." 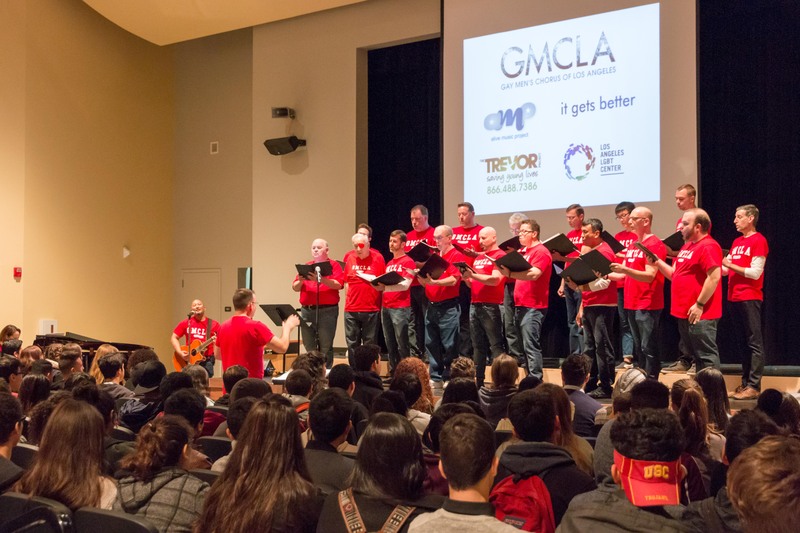 GMCLA has a variety of presentation formats up their sleeves, but their standard programming consists of a presentation featuring chorus members' personal bullying stories paired with a complementary song that enhances the story's message. 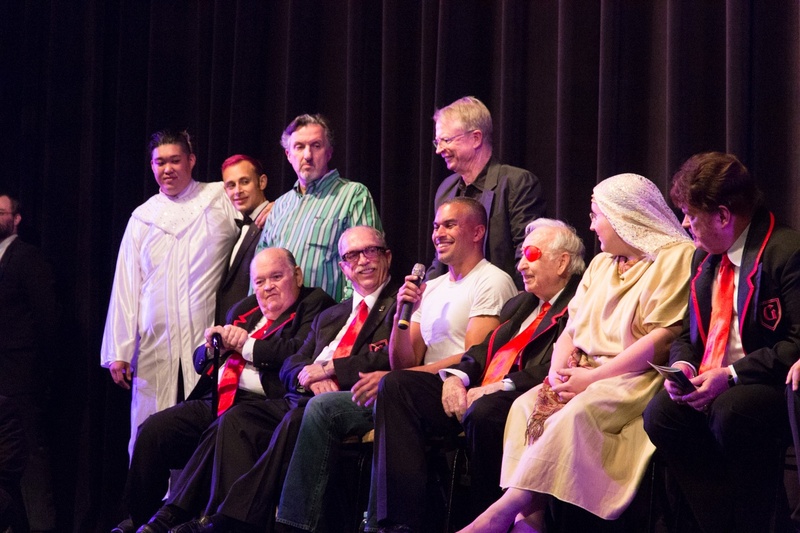 An anonymous Q&A session is included in the performance, and when possible, a song is performed at the end with the combined school chorus and GMCLA. This is then followed with a group lunch. During the presentation, each chorus member introduces themselves, says how long they have been with the chorus, and explains what they do for a living. Nadeau says, "We have a mix of politicians, teachers, waiters, doctors, lawyers, and everything in between. There are preconceived notions about what gay people do for a living. These intros are very powerful and break down those [stereotypes]." Specific chorus members then share their personal bullying stories. 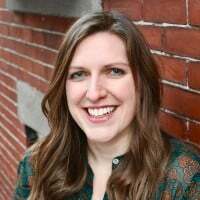 Anti-bullying can be a tricky subject to discuss and that's why Thrasher says it's important that choruses "take the time to craft [their] member stories properly with effective storytelling in mind because [they] don't want kids to disengage." GMCLA's stories are first submitted to Thrasher for review. The stories that are picked for presentation are prepared and scripted, almost theatrically, for the greatest impact. Sample stories include a range of experiences such as chorus member Dennis Hunter's story, "When I was growing up in the Midwest, I felt the need to hide the fact that I was gay. I joined in with the rest of the folks who were picking on another kid that they thought was gay; calling him names and threatening him. I was afraid if I didn't, they would find out about me." He continues, "I felt trapped. It was the 1980s and it wasn't an area where you could come out and feel safe. I hated what I was doing but was stuck. I spent a lot of time regretting my high school years and I tell the kids that they shouldn't have to live with regrets like that. [I tell them] they should start to be kinder and nicer and to start now." To positive experiences like Dave Volpe who says, "My entire life my voice has been distinctively gay. This is how it comes out. It's natural, I can't help it. Imagine sounding like that when you’re 15 and decide to enroll in private high school that happens to be all male and Catholic." He goes on to tell of his experience in high school, which culminates with a friend telling him on AOL Instant Messenger that he had been outed by other students. At that moment he decided to come out and stop hiding. He quickly discovered no one really cared anyway and they supported him! After sharing his story, he adds, "Now I’m 33 and I love my voice. I use it to sing with these amazing men. I use it to talk to you. It’s funny how those traits that we perceive as troublesome when we’re young, the ones that make us stick out and feel self-conscious, actually turn out to be the traits that make us shine brightest." After the presentation, Nadeau says, "students come up and really identify with stories that the chorus members share.We'll see kids flocking to the them wanting to discuss things." The stories are impactful on their own, but the music certainly amplifies the message. Each story is paired with a meaningful and complementary musical piece chosen from the chorus's standard AMP repertoire list. Popular music that resonates with students, like Radiohead's "Creep," is often thrown into the mix. Thrasher explains the musical impact of the presentation, "Music is universal. You don't have to understand syntax to be connected to music and to have music move you. Music creates connection, vulnerability, and a dialogue. You can then talk about the things on people's minds because you've already created openness from music." Nadeau adds, "There are many different types of learning styles and ways to reach young learners. The combination of visual, speech, and music helps solidify the message we are trying to bring." To measure impact and program success, GMCLA does a pre- and post-presentation survey with the students. 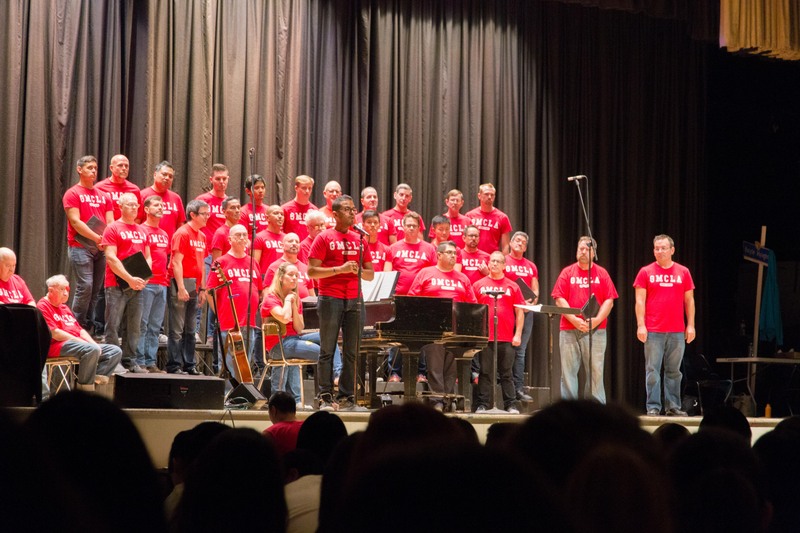 But more importantly, it's the personal connections that are developed between the chorus members and students that highlight how successful the program truly is. Thrasher says, "It's hard to pin down just one story. Almost every time, a kid says 'me too' or can see themselves in your story." But he remembers a time during one anonymous Q&A, that someone submitted a comment card which reads, "Honestly I have no questions because I completely see the confidence and self-acceptance you've gained through your stories. Me, myself is learning (sic) how to love myself, accept who I am because the light bulb came on early. Now my motto is 'I'm me, I'll be me forever no matter the weather.' You guys have inspired me even more thank you!" A parent also commented, "I'm a parent to a 7th grader @ WMS and two elementary schoolers. I just wanted to say THANK YOU for taking the time to share an important part of you all, through words + song. There is so much power in being able to express oneself freely." Volpe shares a special memory of a student who weaved his way up through the crowd and came right up to him on stage. "He was a little thing with square glasses - nervous and earnest. He looked up and said, 'Thank you so much for your story. You're so amazing. You're all so amazing. I just had to tell you that after seeing you all I've decided that today is the day I'm coming out to my father.'" Volpe replied, "Thank you for telling me. You are so brave. When I came out to my father, it was terrifying. But my dad said, 'you are my son and I love you no matter what.'" He continues, "The kid threw his arms around me. And I just remember driving home not knowing where I was because I kept crying. I told the chorus during a rehearsal and everyone was in tears. That for me was the most real evidence that we really are changing kids' lives." "What we don't realize is the impact on the students who may not say anything to us and don't come forward," Nadeau adds. "There are always quiet ones in back taking it all in, not willing to speak up, but have been profoundly impacted. We never know what may come of that. But it's a very powerful thing to understand." AMP doesn't just change the lives of students, it also changes the lives of the chorus members participating in the program. Nadeau explains, "For many of us, middle/high school was a negative experience. We knew we were different. Most of us were not out and were scared to death of coming out. To be able to go back to school to tell these stories is extremely empowering and inspiring to us." "There's also an aspect of power in sharing your own story and standing out there with a group of people who are the same as you," Thrasher adds. "We remember what it was like and how huge of a difference [something like this] would have made on our lives. There's a lot of power for members to be able to give that to people." "Every time we are on AMP or talk about it, we think what if this was us in high school - can you imagine how different our lives would be if a gay chorus came to us and told us everything was going to be fine?" Volpe says. "Yes, we are changing lives but [the students] are also changing ours, for sure." The chorus maintains positive relationships with the schools. Nadeau says they often "provide free tickets to our upcoming concert for the students we visited. Sometimes we have 150+ students attending our concerts for free and we usually help with transportation to get them there." 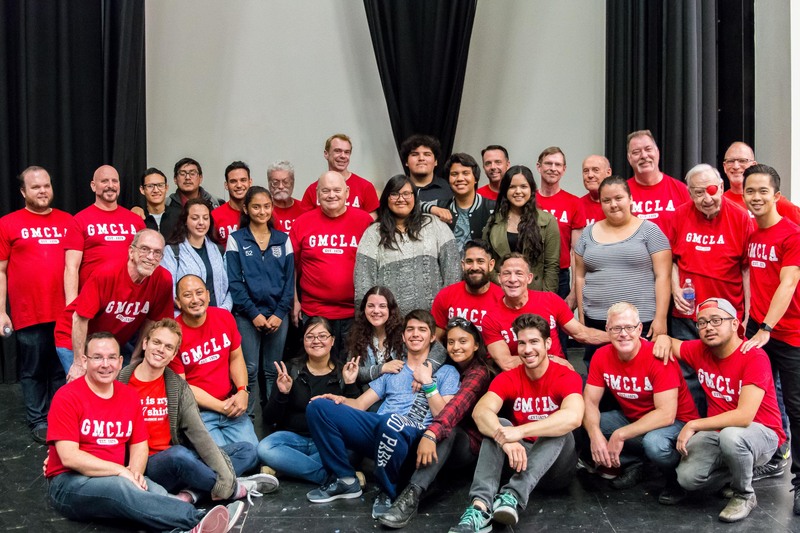 Suffice it to say, GMCLA's Alive Music Project has been a shining example how community choruses can make a difference in their community through music. Start small! Try doing one pilot program and see how it goes. Take the time to craft your stories properly for effective storytelling. Perform music that kids will connect with. Have a clear discussion with your members about what can and can't be talked about in the schools. Things like profanity should be avoided. Prepare for the hard questions that you will inevitably get asked. This may be the first time a young student has interacted with a member of the LGBTQ community and it could be their one chance to ask a question. You want to give them an appropriate response. If you receive pushback about LGBT Awareness, pitch the presentation as anti-bullying through music. Don't pass the microphone around! Allow anonymous Q&A by having students fill out their questions on cards. Then have a facilitator who collects question cards and decides which questions to answer. Be prepared for great positivity, but also be prepared for some negativity. Go in with a thick shell. Just do it. Go for it. Don't be afraid. It's daunting, but 100% worth it!